You pull the trigger, and then -- bang! Seems pretty simple, but you might be surprised by how much is actually going on in that split second it takes for a bullet to travel from the gun to the target. To understand what happens, we're going to take a look at the principles involved at each step of the journey. Cased snugly within the tube of the barrel, the bullet is ready for action. If you're familiar with Newton's third law of motion, you'll understand how the key to this action is reaction. Newton's third law of motion states that if an object exerts a force on another object, the second object will exert an equal and opposite force on the first object. By "equal and opposite," we mean that the strength of the force will be exactly the same, but that it will be exerted in the opposite direction. 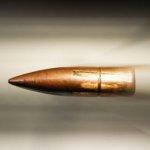 In the case of the bullet, the ignited propellant (gunpowder) exerts a powerful force on the gun. As the propellant burns, it releases gases that generate an enormous amount of pressure behind the bullet. This pressure pushes against the back of the barrel, and the gun must exert an equal and opposite force on the bullet itself. In the barrel, there's nowhere to go but out. The propellant continues to burn as the bullet travels down the barrel -- until it emerges with a bang at the end as the gases are released. But that's not all the barrel can do for the bullet. Many guns also feature special grooves on the inside of the barrel. These grooves cause a bullet to spin as it moves. This spin stabilizes the yaw of a bullet, helping to maintain its straight line of flight during its trip through the air. Although it just got blown out of a gun with tremendous force, the bullet is up against a slew of invisible obstacles that affect its trip through the air. All these forces alter a bullet's trajectory so that it doesn't travel in a perfectly straight line. The most important of these obstacles is gravity. No matter how fast the bullet is going, gravity is pulling it down toward Earth. Another such obstacle is air resistance, also known as drag. We don't live in a vacuum; we share our open space with molecules. Therefore, air slows the bullet down. This is where the design of the bullet comes into play. A streamlined, aerodynamic bullet (with a pointed nose and a boat-tail) will cut through the air with minimal air resistance. Bullets may be small, but they carry a deadly punch. The reason for this is momentum, which is made up of velocity times mass. In other words, what bullets lack in size, they make up for in speed. Much to the chagrin of the shooter, this momentum can cause a bullet to pierce the target and keep going without stopping. So, some bullets are designed to mushroom, or open up, upon impact for a maximum stopping power. This way, the bullet can end its journey as quickly as it began.